Free shipping. Buy direct from HP. 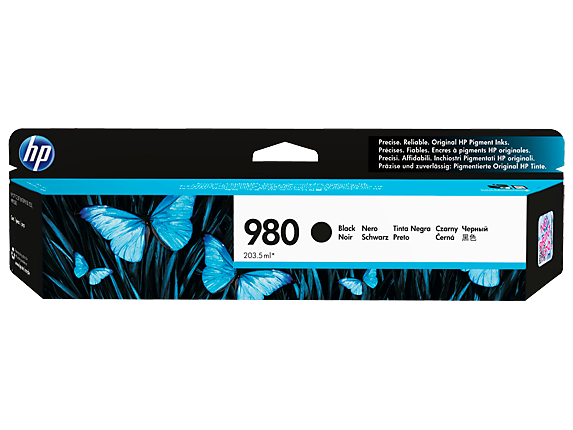 See customer reviews and comparisons for the HP 980 Black Original Ink Cartridge. Upgrades and savings on select products. Original HP pigment inks are formulated to produce quality business documents for up to half the cost per page of color lasers—and keep your HP Officejet Enterprise printer or MFP performing at top speed to deliver consistent, durable prints. Make no compromises. Print high-quality documents for up to half the cost per page of color lasers. Print even faster—and save even more per page—by setting your printer to General Office mode. Ensure peak performance with Original HP inks—specially formulated to help your printer maintain top speed. Count on Original HP pigment inks for durable prints that resist water and smearing and last for decades. Represent your business best with Original HP pigment inks—designed for consistent, professional results.Choose Original HP ink cartridges specially designed to work with your HP Officejet Enterprise printer or MFP. Make no compromises. Print high-quality documents for up to half the cost per page of color lasers.Print even faster—and save even more per page—by setting your printer to General Office mode.Ensure peak performance with Original HP inks—specially formulated to help your printer maintain top speed. Count on Original HP pigment inks for durable prints that resist water and smearing and last for decades.Represent your business best with Original HP pigment inks—designed for consistent, professional results.Choose Original HP ink cartridges specially designed to work with your HP Officejet Enterprise printer or MFP. Install with ease. Load cartridges in a snap—each one is color coded and designed to fit uniquely in place.Print up to 10,000 pages from a single cartridge.Help save paper and ink by printing only the web content you need, using the free HP Smart Print tool.Centrally monitor and control printers—and stay ahead of supplies ordering—with HP Web Jetadmin. Choose cartridges specially tested with your printer to meet ISO standards for cleanrooms.Save resources—use up to 90% less supplies and packaging by weight compared with lasers.Reduce your impact—easily recycle your Original HP ink cartridges for free through HP Planet Partners. 1 Cost per page (CPP) claim is based on the majority of color laser MFPs ≤$3,000 USD and the majority of color laser printers ≤$1,200 USD as of December 2013, based on market share as reported by IDC as of Q3 2013. ISO yield is based on continuous printing in default mode. CPP comparisons for laser supplies are based on published specifications of the manufacturers’ highest-capacity cartridges. For details, see http://www.hp.com/go/officejet. CPP based on HP 980XL ink cartridges' estimated street price. For more information, see http://www.hp.com/go/learnaboutsupplies 2 Fade resistance based on paper industry predictions for acid-free papers and Original HP inks; colorant stability data at room temperature based on similar systems tested per ISO 11798 and ISO 18909. Water resistance based on HP internal testing, using paper with the ColorLok® logo. 3 Program availability varies. Original HP cartridge return and recycling is currently available in more than 50 countries, territories, and regions in Asia, Europe, and North and South America through the HP Planet Partners program. For more information, visit http://www.hp.com/recycle. 4 Comparison based on printing in Professional Mode. 5 Page volume based on HP 980 Black Original Ink Cartridge. 6 Page volume based on HP 980 Cyan, Magenta, or Yellow Original Ink Cartridge. 7 Supports Microsoft® Internet Explorer 7.0, 8.0, and 9.0, as well as Mozilla® Firefox versions 3.5 through 5.01. 8 Universal device plug-in is offered with HP Web Jetadmin 10.3 SR4 and higher. HP Web Jetadmin is free and available for download at http://www.hp.com/go/webjetadmin. 9 Compared with the majority of color laser MFPs ≤$3,000 USD and the majority of color laser printers ≤$1,200 USD as of December 2013. Calculation compares weight of supplies and cartridge packaging needed for the same amount of pages based on ISO yield and continuous printing. 10 Based on results of third party testing of HP Officejet Enterprise Color MFP M585dn, HP Officejet Enterprise Color MFP M585f, and HP Officejet Enterprise Color Flow MFP M585z with HP 980 Original ink cartridges.